Yesterday I participated in a 100 km bike ride – cycling that is. 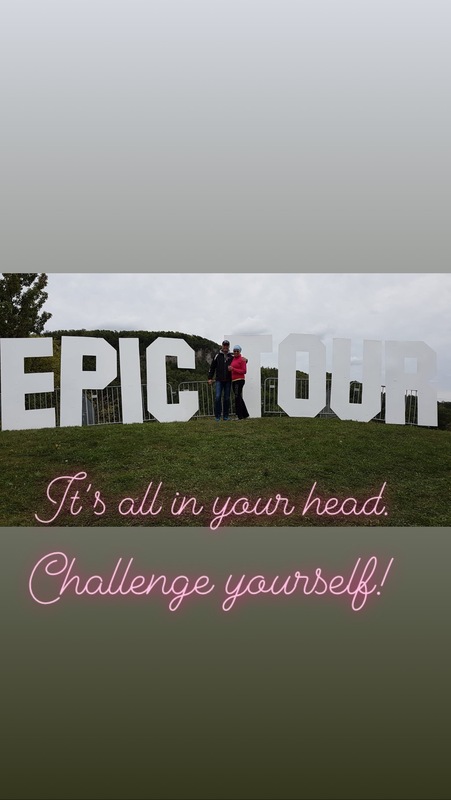 My husband and I had signed up for the Granfondo Epic Tour in the spring. We didn’t really think about our trip to Europe and that we wouldn’t be here to train. I really doubted myself and I thought that I wouldn’t be able to cycle 100 km without having been in the saddle for 7 weeks. Sometimes that’s all people need to hear – words of encouragement and someone who believes in them. The course ended up being a little bit longer than what I signed up for and I ended up with 107 km. It was a tough ride because it was cold and it was super windy with wind gusts of 32 km/h. I did better than expected and finished in 4 hours and 13 minutes. I am happy that I took on the challenge. Our mind plays tricks on us. It’s all about overcoming what the little voice in our head says. Get a boost of optimism – someone else’s enthusiasm and optimism can be contagious. Take action despite your fears – whenever I think I can’t do something I am determined to prove myself wrong. Visualize a positive outcome – I see myself getting a positive result. It’s all about getting better and mentally stronger. So keep spinning these wheels in your mind and know that you are in control.